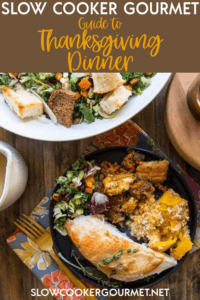 Whether you are hosting Thanksgiving Dinner for the 1st, 5th or 20th time, my Ultimate Guide to Thanksgiving Dinner will help you streamline cooking, reduce stress, and have a more relaxing Thanksgiving holiday! 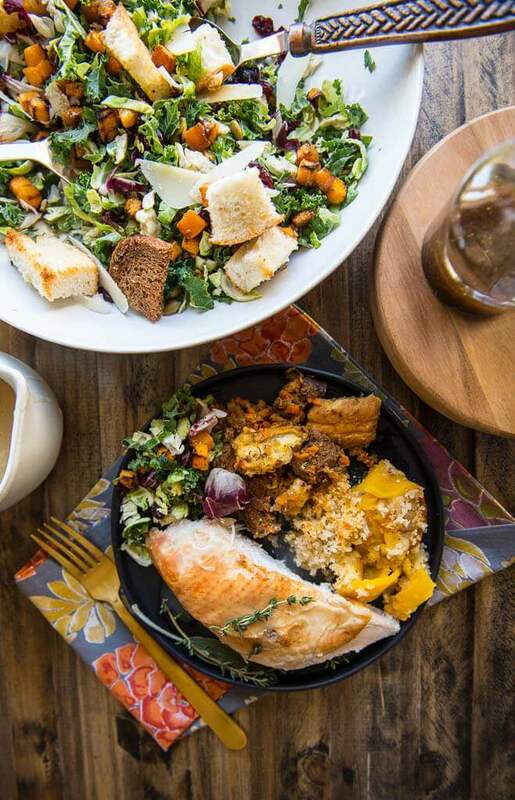 Have you started planning your menu for Thanksgiving yet? It’s coming in just a few days and I’m here to help those in need of a simple to make dinner. I’m all about using my slow cookers for holiday meals. Not only does it free up oven space, but it’s also a really easy way to keep food warm as you go about preparing other parts of the meal. I’ll share all of my favorites with you today along with some of my favorite tips for reducing the workload and letting you enjoy the day with your family. As much as I love to try new foods, I won’t get too crazy here. 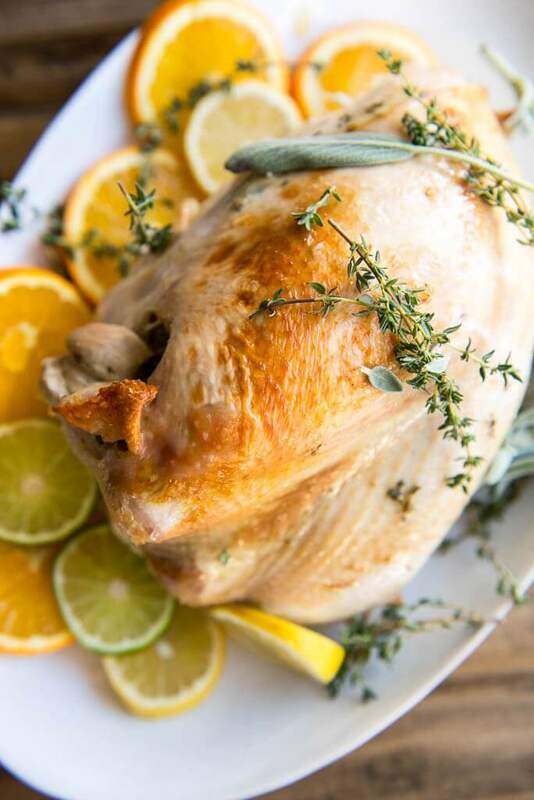 Most of us want a delicious turkey for Thanksgiving and I will share a few of my favorite ways to get turkey on the table. 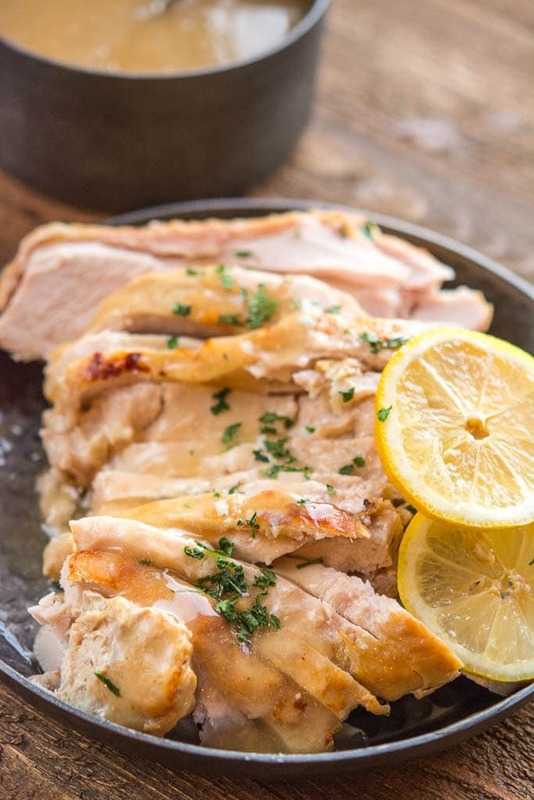 Slow Cooker Turkey Breast – For a smaller crowd, my slow cooker turkey breast is a great option! My friend Amanda taught me to make this and was gracious enough to allow me to share. This is a delicious recipe that is so very easy to make and will keep you from having to fire up the oven and deal with all the mess. 2. For a larger crowd, or if a more traditional turkey is your thing, be sure to check out my guide to cooking a turkey on my other website, Garnished Plate. 3. This year, I’m going to spend this weekend before Thanksgiving testing out some new turkey recipes and I’m planning to use my Traeger grill to smoke a turkey. This recipe on their website looks delicious, but it remains to be seen what I’ll end up with. If it’s good, I’ll be sure to share! And of course I have to mention that no turkey is complete without gravy. Both of my recipes above include instructions for making gravy! A slow cooker (to make a turkey breast or to keep your sliced turkey warm). This Ninja Multicooker even has a baking or roasting function that would fit a smaller turkey. Next up we must talk mashed potatoes. I love using my slow cooker or even my Instant Pot to make mashed potatoes. It takes away the stress of watching the pan, waiting for water to boil and getting the timing just right. Plus, you can mash them up right in the slow cooker and leave them on warm for dinner. Doubly easy! I have several mashed potato recipes here on the blog, so no matter what you are looking for, I’ll bet I’ve got it covered. 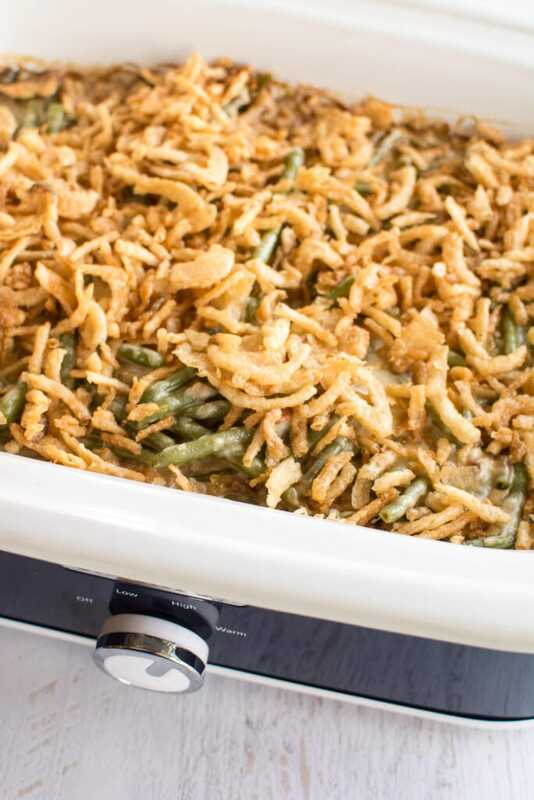 I find that side dish preferences vary from family to family, and sometimes even within our family from year to year. My husbands family used to always have chicken and noodles every Thanksgiving, where as my family tradition was cream cheese corn. No matter what you decide, I have a lot of side dishes that are easily made in the slow cooker. Shop for perishables the week of and go on Monday or Tuesday during the day if possible to avoid crowds. Better yet, order online for delivery. Pour a glass of your favorite wine and enjoy the process! Recruit help from your family! Get someone else to clean up the dishes! No shame in paper plates one day out of the year. Planning to use your slow cooker for Thanksgiving? Leave a comment here and let me know! I’d love to hear about your menu and your plan. And, better yet? Hop over to Instagram and post a pic of your prep, meal or kitchen on Thanksgiving Day and tag me #slowcookergourmet. I love your recipes and the slow cooker recipes take some of the stress from holiday feasts. 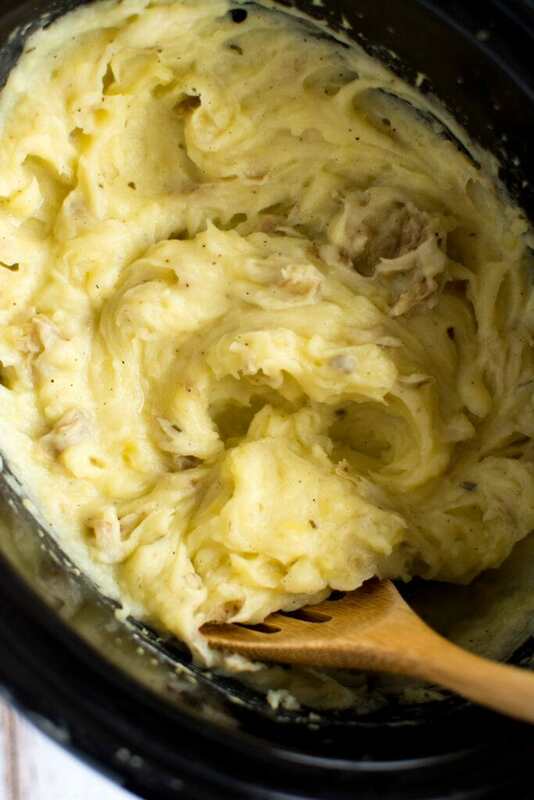 Love your Slow Cooker Garlic Mashed Potatoes recipe. Will definitely be making it this year and skip the hassle of last minute potato madness. 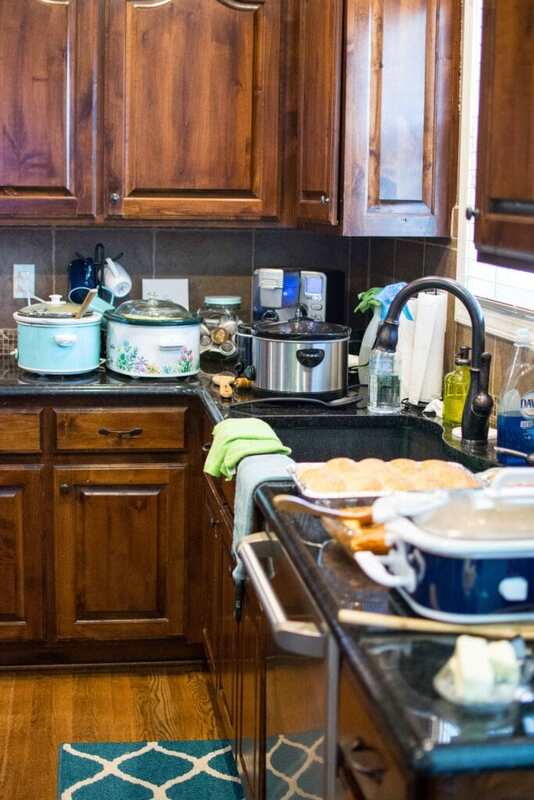 Also love the picture of your kitchen :0) Happy Cooking and Happy Thanksgiving to all!! Thank you so much, Reenie! !